Nearly one in four teens admit to using a prescription drug that wasn’t prescribed to them by a doctor, and a recent survey from the Food and Drug Administration shows 3.6 million middle and high school students are now using e-cigarettes (vapes) in the United States. A prescription drug abuse health education specialist answering questions about the risks of sharing prescription drugs, how to talk about it with your kids, and keeping prescription drugs out of your student’s hands. A tobacco health education specialist answering questions about vaping, Juuls, and quitting tobacco. A member of the Twin Falls Police Department answering questions about the legal trouble a student can face for distributing prescription drugs (dealing), taking someone else’s prescription drugs, or vaping under the age of 18. "Keeping our students safe and healthy is a joint effort between the schools and parents. 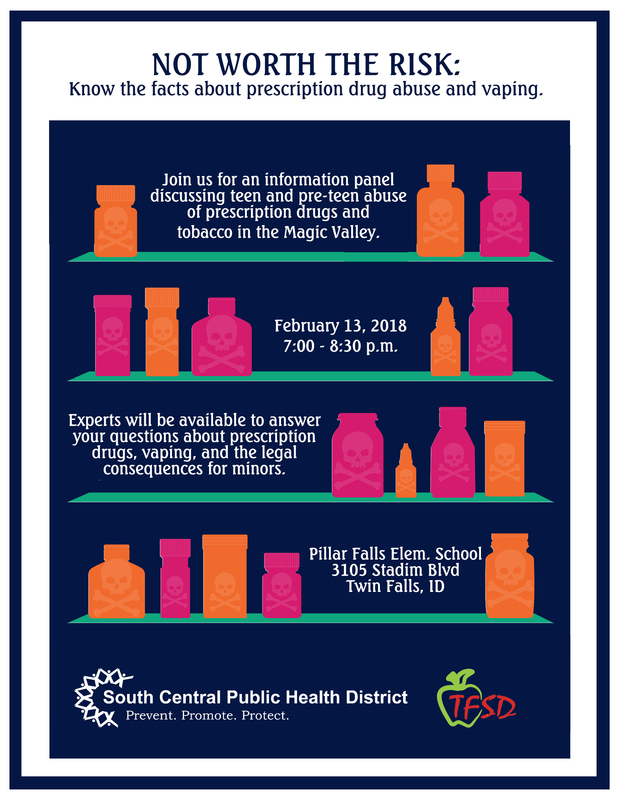 It is important that parents take time to talk with their children about the importance of proper handling of medications, never taking pills offered to them, and the importance of reporting such incidents to an adult immediately, to help assure safety for all," said Eva Craner, Director of Public Relations for the Twin Falls School District. For more information about prescription drug abuse, tobacco, vaping, or cessation classes please visit phd5.idaho.gov/tobacco, or call (208) 737-5900.